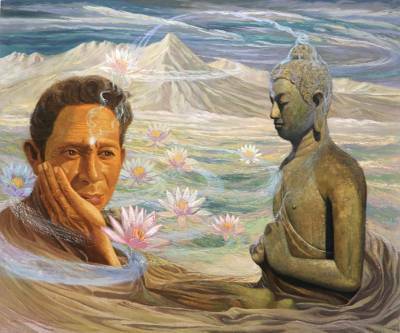 Man with Buddha and Lotus Painting Realism Art from Bali, "Buddha Glance"
Symbols of purity, lotuses float on cirrus clouds as a man contemplates a stone sculpture of Buddha. The man's eyes and expression convey deep admiration and contemplation in this painting by Made Pasek Kusuma Wijaya. He paints with oils achieving a vivid sense of realism while at the same time capturing the power of spirituality.